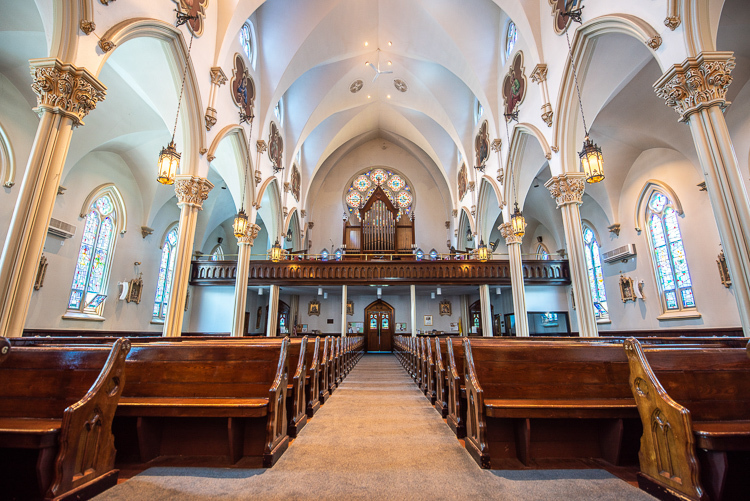 St. Joseph’s Parish, Ashton, is nearly as old as the Diocese of Providence, and traces its history as a mission back several years earlier than the spring of 1872 when this See set apart from that of Hartford. Previous to 1861, when St. Patrick’s Church, Valley Falls, was erected, Catholics from Ashton were obliged to travel to Pawtucket on Sundays and holy days to attend mass at St. Mary’s. Occasionally a mission priest would pass through and celebrate Mass for then in a hall or dwelling. The Valley Falls parish grew rapidly and St. Joseph’s was established as a mission by Reverend Hugh J. O’Reilly, pastor at St. Patrick’s. Toward the close of his rectorship, the Londale Company, owners of the water privileges on what is now the church side of the Blackstone river, built a new mill in the village of Ashton. Between 450 and 500 persons were required to operate it, and a large number of Catholics came to the village to work. Soon these families wanted a church in Ashton. The consent of Bishop Francis P. McFarland of Harford, to which Rhode Island belonged, and Father O’Reilly decided to erect a church in Ashton. The people responded generously to the request for funds. John M. Ryan, a storekeeper in the village, had donated to Bishop McFarland on February 23, 1871, land for the future new church and the Lonsdale Company donated $500 to the building fund. It was a strong frame church erected in a few months. Unpretentious and not very attractive, but, nevertheless, brought considerable joy to the Catholics of Ashton who no longer were obliged to travel to Valley Falls to Mass. As soon as the new church was finished, Bishop McFarland presided at the dedication ceremonies and the first Mass was celebrated in early 1872. Father O’Rielly died soon after the church was completed and Reverend Thomas Kane became pastor at Valley Falls and, consequently, took charge of the Ashton mission. The missions at Ashton, Berkeley, Albion, and Manville were set aside as a separate parish by Bishop Thomas F. Hendricken on November 1, 1872 and the Reverend James A. FitzSimon was named the first rector. Father FitsSimon built a new rectory and parish hall at St. Joseph’s. The greatest material achievement of his long pastorate was the construction of a new parish church, which was dedicated in April, 1899. Father FitzSimon died on September 28, 1905 and was succeeded by Reverend Jeremiah W. Baggott, who served the parishioners at St. Joseph’s for 18 years. He was transferred to Newport on July 29, 1921 and Reverend Joseph P. Gibbons was appointed as pastor. He served for nearly nine years until Febraury 7, 1930, when he was succeeded by Reverend Dennis F. Fullam who served for seven years. He was succeeded by Reverend A. Hugh McKenna for a short period of time being succeeded by the Right Reverend Monsignor Daniel E. Regan serving for eight years succeeded by Reverend Edward J. McManus who served seventeen years and succeeded by Reverend Thomas J. Dempsey who served the parishioners as pastor for eighteen years. Reverend Francis J. Keefe succeeded him from 1980 to 1992. Father Keefe completed a major renovation of the church and rectory in 1980 and replaced the old parish hall with a new Parish Center in 1982. Reverend John W. Hunt is the present pastor and has recently supervised another preservation project for church and rectory in 1996. In more recent years, St. Joseph’s Parish boundaries have been adjusted to meet present day needs with the establishment of St. Jude’s Parish in Lincoln, and St. Aidan’s Parish in Cumberland. The parish celebrated 100 years of the existence of the church building in 1988 and in 1997 celebrates 125 years existence as a parish. Our architect in 1996, Richard Hunt, said he believed the structure is the largest of its kind in the State of Rhode Island. Truly, St. Joseph’s may be considered a mother parish of the upper Blackstone Valley. The dedication and devotion of the pioneers, both clergy and laity, permeated the spirit of generations to the present day. The joyous occasion of our 125th Anniversary in 1997 is an indication of the unbroken continuity of local tradition, and most important of all, the love of our faith from 1872 to the present. May the next one hundred years be even more glorious. St. Joseph’s Parish was established in 1872 as a mission of St. Mary’s Church, Pawtucket, and a church, a rectory, and a “school house” (the old parish hall) were erected soon thereafter on the present Mendon Road site by the first pastor, the Reverend James A. FitzSimons. At the time, this was the only Roman Catholic church between Valley Falls and Woonsocket, and though built primarily to serve the mill laborers at nearby Ashton and Berkeley (at first almost exclusively Irish, later joined by French Canadian and Italian immigrants), St. Joseph’s drew communicants from throughout central and northern Cumberland and parts of nearby Lincoln. By 1888 the parish’s growth necessitated the construction of a new church. According to contemporary sources, the old church was dismantled and its materials were used for part of the new building, which was dedicated in April of 1890. Parish tradition maintains that the rectory was built at the same time as the second church by an 1878 view of the parish buildings from the south clearly shows the parish hall, with a smaller vestibule, and the rectory. It thus seems likely that the parish hall and rectory are survivors of the original building campaign of the 1870′s, the latter with a later front addition and the former possibly with additions to the northeast or northwest, perhaps dating back from the 1888 – 1890 period. As with other Rhode Island parishes, St. Joseph’s not only provided sacraments to the faithful but served as an important social center for the inhabitant of the relatively remote mill villages and farms of the region. A number of church- sponsored organizations such as the Sons of St. Joseph, the Altar Society, and the Children of Mary fulfilled the social as well as the spiritual needs of local Catholics. More secular activities such as church suppers and bazaars could be attended by all in fact drew many non-Catholics. St. Joseph’s has served the varied needs of a broad constituency from its landmark buildings for over a hundred years. The parish is one of the Blackstone Valley’s chief cultural resources.